1893 Lorillard Red Cross Long Cut Tobacco (N266)Choyinski[sic] and Goddard. The set designated N266 by Burdick consists of 25 known unnumbered cards. It is one of the easiest sets to date; 1893 is printed right on the fronts of the cards in very small, faint print below the “Red Cross” name. Each oversized “tall boy” card depicts a match between two fighters and illustrates a specific move. 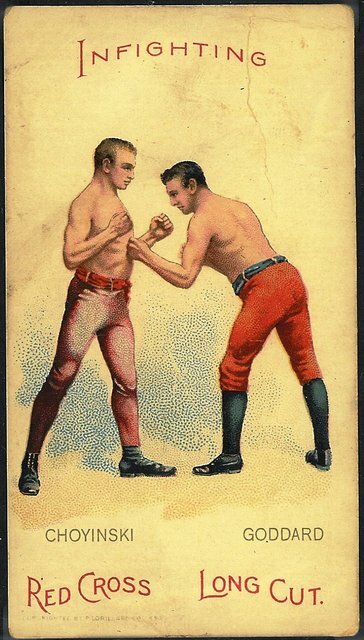 Some of the illustrations show blows permitted under the rules of the London Prize Ring (“L.P.R.”), but not under the modern rules for gloved prize fights. Card backs contain a short blurb about the fighters and fight depicted, and a huge Red Cross advertisement. These colorful cards are larger than average tobacco cards but smaller than postcards, trade cards or cabinet cards, which accounts for both their desirability and their difficulty in better conditions.